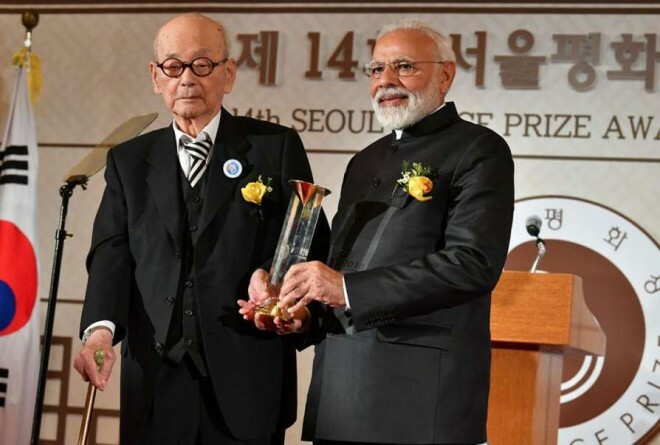 Seoul, Feb22: Prime Minister Narendra Modi was conferred with the prestigious Seoul Peace Prize for 2018 on Friday for his contribution to international cooperation and fostering global economic growth. Modi expressed his gratitude for the prestigious honor and said, "This award belongs not to me personally, but to the people of India." “The success that India has achieved in the last five years is due to aspirations, inspiration, and efforts of the people of India. On their behalf, I accept the award and express my gratitude,” he said. He said he was honored that the award is being conferred on him in the year that India celebrates the 150th birth anniversary of Mahatma Gandhi. He dedicated the $200,000 (Rs 1.4 crore) prize money to ‘Namami Gange Programme’, which is flagship programme of his government to accomplish the twin objectives of effective abatement of pollution, conservation, and rejuvenation of River Ganga. Modi is the 14th recipient of the award and the past laureates included former United Nations Secretary-General Kofi Annan, German Chancellor Angela Merkel, and renowned international relief organizations like Doctors Without Borders and Oxfam. The Seoul Peace Prize was established in 1990 to commemorate the success of the 24th Olympic Games held in Seoul. The award was established to crystalize Korean people’s yearning for peace on the Korean peninsula and in the rest of the world.